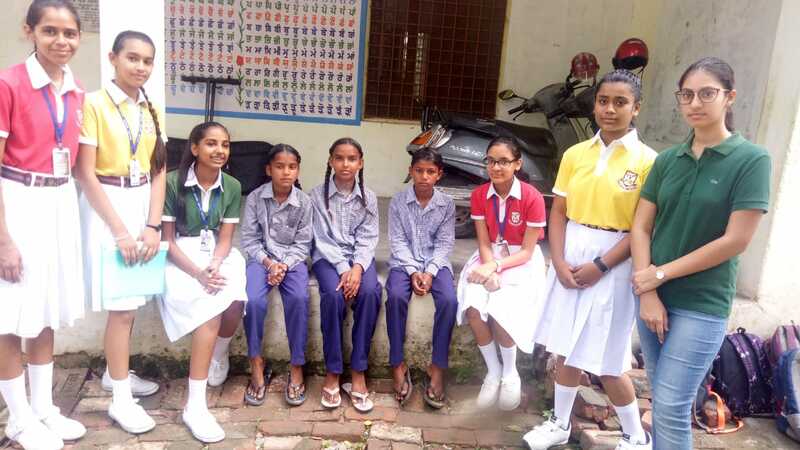 Award participants of Bawa Lalvani Public School are doing their Service at a government elementary school in Phulewal, Kapurthala. The report has been submitted by Ms Ekta Dhawan, Principal, Bawa Lalvani Public School, Kapurthala. The aim of the ongoing programme is to bring about small but significant changes in the lives of rural people, such as helping them to develop skills, to realize and cherish the joy of learning and to broaden their horizons by making contacts, thereby motivating them to improve the quality of life of others. 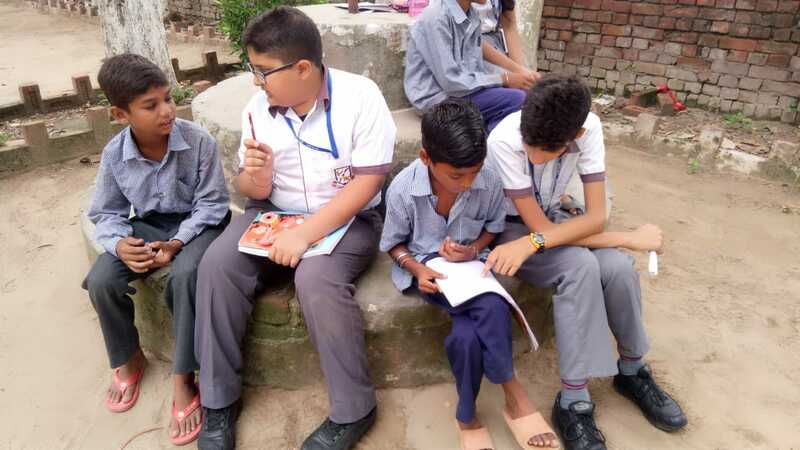 As part of the IAYP Programme, the Award participants engaged in community service at a government elementary school in Phulewal village, Kartar Road, Kapurthala. The participants delivered a ‘Three Aspect’ routine, i.e., teaching a morning prayer, a group song titled 'Jaha Dal Par Sone Ki Chidya Karti Hai Basera' and mathematics. These were in the form of a classroom addressal to an audience comprising 39 rural students within the age group of 5 to 14 years. The participants also enacted a demonstration that involved explaining the importance of proper hand wash post the use of washrooms and prior to consuming food. Students were advised and encouraged to refrain from defecating in open spaces. The rural student audience responded actively and participated keenly in what was being discussed, making the hygiene awareness programme a success. On the 6th of August, 2018, GD Goenka World School, Sohna organized an orientation workshop to create awareness of the award Programme (IAYP). The workshop was conducted by the Programme Manager, Bivujit Mukhoty, for grades 9th and 11th students. The school’s Director-Principal, Dr Neeta Bali, briefed the students about the Programme, highlighted its benefits and encouraged the students to register for it. She introduced Mr Bivujit Mukhoty, who explained the Award Programme to them in detail. He elaborated on the inception of the Programme and delivered key insights on it. He also narrated his journey of running the Award Programme in the country and shared experiences of young people who have already completed all levels of the Award Programme. Bivujit emphasized the Award Programme as a prominent platform for young people to gain a variety of experiences, while also showcasing their hidden talents through various aspects of the Programme. He described the Programme as following a holistic approach to learning, while covering domains of skill development, physical recreation, social service and adventure. The session concluded with Bivujit Mukhoty awarding Anish Gurung a Bronze Award on his successful completion of the Bronze level of the Award Programme. Award participants from Bawa Lalvani Public School, Kapurthala, performed street plays on drug abuse, highlighting the need to vanquish it. Following is a report from Ms Ekta Dhawan, Principal, Bawa Lalvani Public School, Kapurthala. The drama has been used as an effective measure to evoke emotions in response to the informational content being delivered. The combination of emotion and information works to promote individuals to become more involved in family and community-based prevention activities. This study demonstrates the efficacy of drama as a mechanism to inform, educate and motivate. The Bronze Award participants have been engaged in an effective social service programme titled ‘Say No to Drugs’. Through this programme, they have been reaching out to those members of the general public who are victims of drug abuse or have succumbed to use of drugs as addicts. The students performed street plays for audiences at Jallowkhana Railway Station, Bus Stand and Shalimar Bagh, exploring the grave issue of prescription drug and heroin abuse which is deeply affecting the town. There are countless intense stories about how drugs have ruined families and lives, causing innumerable injuries and even deaths. The plays showed how easily teens can be pressured by their peers and lured into taking drugs. Educators believe that for most students, it is easier to act out the issues than to talk about them with their parents. The plays’ goal, therefore, was to enlighten teens and adults, providing them with tools to protect young people from venturing into the extremely dangerous path of drug abuse. In the coming months, the Award participants will offer customized performances of the play to different schools and community groups. “If anybody, unfortunately, happens to be in one of these situations, it will help them know what to do,” said the Award participants. Manika Sharma from Jodhamal Public School, Jammu, received her Gold Award in 2014 at New Delhi. Manika shared her life transforming Award Journey with us. My journey of achieving the Gold Award completed in 2014 when I was in Jodhamal Public School, Jammu. This Award added an extra dimension to my personality. After becoming a Gold Award Holder, I have been able to develop greater levels of confidence and self-esteem. My beliefs have strengthened and I have become more persuasive. I have learnt how to voice my concerns and contribute my bit in bringing about positive changes in society. I have learnt all this through community service and the residential project. These projects have made me flexible, enabling me to adjust in every situation. As part of the Residential Project, I lived the life of the residents of small villages, interacted with their culture and organized a literacy campaign. Doing this, I’m overwhelmed that I have been a productive part of society. IAYP has enlightened me about the productive use of my leisure time to acquire new skills. The ‘adventure’ aspect of my journey has helped me cultivate abilities like cooperation and leadership. It has helped me measure my physical strength through various adventurous tasks. This Award has given young people like me the phenomenal gifts of exuberance and the ability to choose among skills, physical recreation, etc. This 18-month long journey has been a marvellous experience that has offered me a lot to learn at every step. Nostalgia has overcome me as I write this article. The Award has been a major life changer in boosting my self-confidence, teaching me life skills and enhancing my personality. I must thank my school for introducing me to IAYP, my Award leader for guiding me throughout my journey and my family for being a pillar of support and encouragement. Programme Manager Bivujit Mukhoty and Priyank Kumar Gupta, Head IT & ORB, visited schools of Dehra Dun on 28th July and 30 July 2018. A brief report of this visit follows. The visit to the Dehra Dun schools started on 28th July 2018 with a meeting with the Award supporting team at Selaqui International School, where Bivujit Mukhoty discussed the progress of the Award Programme in this centre with the Award Leader - Devvrat Badoni. The team visited Sajeev Dixit - Award Leader, The Asian School, Dehra Dun. Later, the NAA team visited Selaqui International School again to deliver an orientation to the students. The session was attended by 120 students. On 30th July the team met with Hari Om Tripathi - Award Leader, Welham Boys School, Dehra Dun. Next, the NAA team visited the Purkal Youth Development Society, Dehra Dun. The team was welcomed by the Award Leader - Shalini Gupta. NAA team had a detailed discussed and meeting with the core team of PYDS including G.K Swamy – Founder & CEO; Harwant Singh - Principal, Anand Krishna Swami - Dean of STEM, Manish Chandel - Office Manager, Sarika Nandrjog - Dean of Operations and Shalini Gupta. The team did an analysis of the success of the Award Programme and discussed the measures to deliver the programme to all eligible students. Bivujit Mukhoty delivered an orientation to 100 students of PYDS. After the orientation, GK Swamy - Chairman and CEO, handed over 6 Bronze and 3 Silver certificates and badges to the participants who had completed their Award Journey.